Born the son of a prominent musician, Ernest Leonard Blumenschein began his life with an emphasis on music. He attended the Cincinnati College of Music on a scholarship in 1891, and also began studies at the Cincinnati Art Academy during this time. He continued his exploration of both art and music when he went on to the Art Students League in New York, studying art and working as a symphonic violinist. In 1895, Blumenschein left the United States for Paris and began studies at the Julien Academy under the tutelage of Constant, Laurens, and Collin. During this time he befriended Joseph Henry Sharp who told Blumenschein and Bert Greer Phillips about Taos, New Mexico and its beauty. Upon their return to New York City, Blumenschein and Phillips shared a studio and Ernest began working as an illustrator. 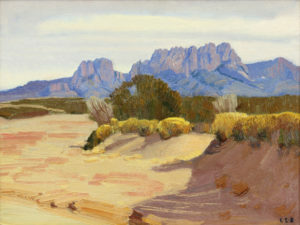 In the winter of 1898, McClure's Magazine commissioned a Southwestern sketching trip for Blumenschein that sent him into New Mexico for the first time. He fell in love with the country and decided to remain there. That same year Blumenschein sent for his friend Phillips, and together they established the art colony of Taos. They were followed by Joseph Henry Sharp, Eanger Irving Couse, Oscar Edmund Berninghaus and Blumenschein's pupil, W. Herbert Dunton. Although his heart belonged to the Southwest, Blumenschein continued to divide his time between Taos, New York, and Paris. He worked as an illustrator and taught at the Art Students League in New York, but it was in Paris where he met and married the established artist Mary Shepard Greene. Blumenschein spent his summers sketching and painting in Taos where his works of the Indians of that area were stylized but still influenced by the realistic illustrations he did for books of Jack London and Booth Tarkington as well as Harper's, Century, Scribner's and several other noted magazines of the day. In 1919, Blumenschein moved his family to Taos and gave up his career as an illustrator to paint full-time. Aware of the modernists like Dasburg and Marin, he began paying more attention to complex compositions and free colors. The little Taos art colony thrived as did Blumenschein and the other artists living there, and their legacy remains a strong influence to this day. Blumenschein's works are held by the Metropolitan Museum of Art, Brooklyn Museum, Museum of Modern Art, National Gallery of Art, Museum of New Mexico, Eiteljorg Collection, Anschutz collection, the permanent collection of the Harwood Foundation, and many important private collections throughout the world.